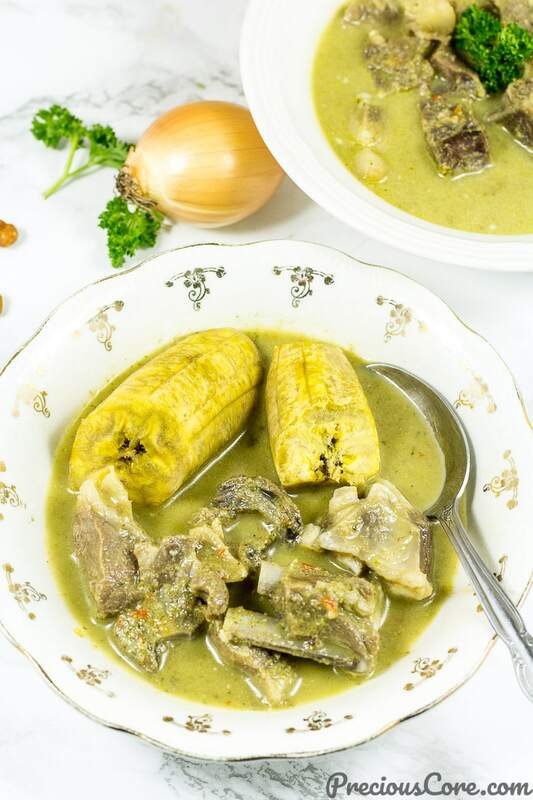 A hearty soup cooked with goat meat, herbs and spices. 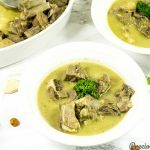 This Goat Meat Pepper Soup recipe is so easy to make and perfect for cold days! So on cold days like these, there are two things I like to fit in my mouth (translation: eat or drink). It’s either I make some “fever grass” (lemon grass) tea or I make some pepper soup! Oh, I also like gulping down a nice big cup of hot chocolate when it’s cold. And I like baking too under the pretext of ‘wanting to keep the house warm’. Ha. It is a pure delight. The star of the dish here is the goat meat. Goat meat is farrr better than beef. 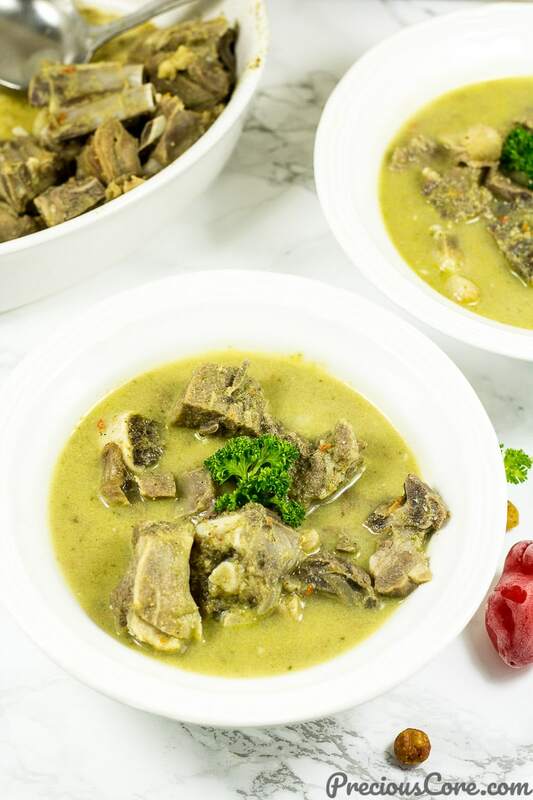 Here are some reasons why you should eat goat meat. It is mostly grown in small local farms so it is cleaner that other kinds of meat (beef, chicken, pork) which are largely raised with added hormones and antibiotics to meet up with the huge demand. So it is cleaner. It is very low in fat. In fact, it is called the leanest meat. 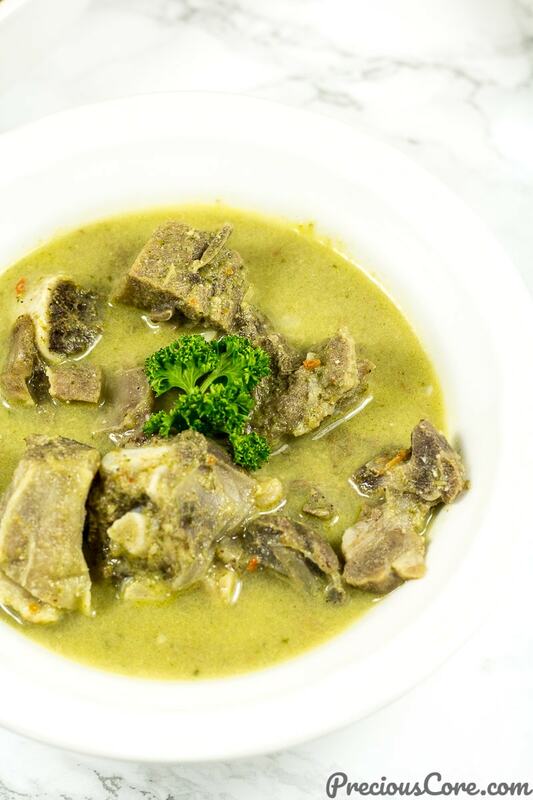 When cooked into a delicious soup like this goat meat pepper soup, goat meat is absolutely to die for. So why won’t you make some? I love enjoying it with some boiled plantains. Absolutely to die for! You can pair it up with any side you like: African white yams and French bread are other sides I enjoy with this goat meat pepper soup. You can also enjoy it on its own. 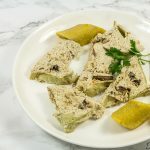 It is a great appetizer! 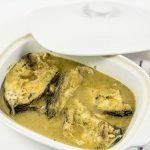 I made a video to show you guys the whole EASY process of cooking (and tasting) goat meat pepper soup. So watch then go make some and enjoy! Have you subscribed to my YouTube channel yet? Click here to subscribe so you never miss any of my videos. 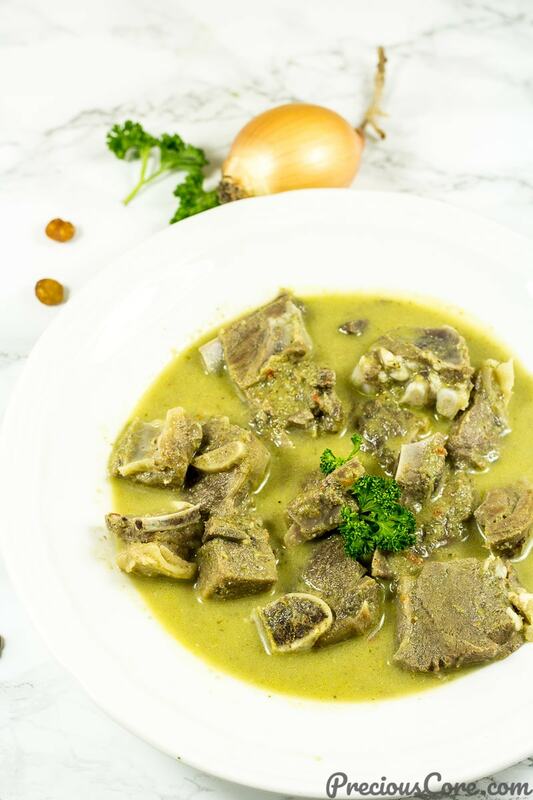 A hearty soup cooked with goat meat, herbs and spices. 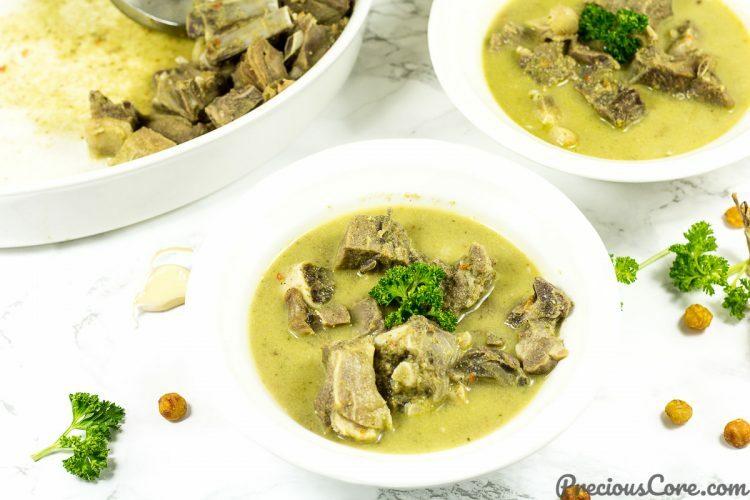 This Goat Meat Pepper Soup recipe is so easy to make and perfect for cold days. Rinse meat thoroughly and place in a pot. Add water to the level of the meat (about 3 cups). Bring to a boil on medium heat. Let the meat boil for 20 minutes (follow the 2nd instruction while it boils). Place the Njangsa seeds and white pepper in a blender (I normally use the small cup of my blender.) Grind into a powder. Cut the sprigs from the celery and parsley and add in. Add in ginger, garlic, pepper, and onions. Add about half a cup of water and blend into a paste. After meat boils for 20 minutes, add in salt, seasoning cubes (Maggi) and spice blend. Mix well. Cover and let it cook for about 20-30 minutes more until the goat is tender and easy to chew. I normally take out a piece of meat and let it cool then I taste it to check if it is well cooked. Also, at this point (while it cooks) check the consistency of your soup. If it is too thick add in more water to form the consistency you form. Also taste to ensure that the seasoning is perfect. Serve warm as it is or with any starchy side of choice. 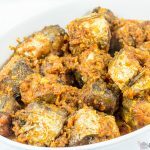 I love it with boiled semi-ripe plantains, boiled African white yams or even French bread. Enjoy, friends! Dear Precious, goat meat is always so tasty and delicious. I love the pepper soup combo and plantain as well. 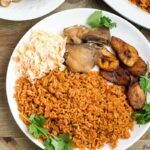 Yes, it is so good with plantain! Thanks, dear. Dear Ma, Thank you for the recipe! Please do you know where I can get njangsa seeds online? I live in the U.S. Unfortunately, I don’t know where you can get it online. I live in the US too and I get mine from African stores or the African aisle in Asian stores. Hope you find it, dear. 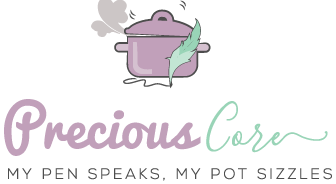 it’s always been nice cooking with precious core, u r indeed an inspiration 2 many women, God bless u. I perfected my cooking thanks 2 u.